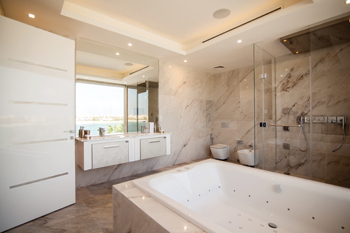 Finasi has high quality provided fit-outs for villas at Emirates Hills. When the developers of the 65-storey Burj Daman were seeking a fit-out firm worthy of creating the interiors befitting the stunning new addition to Dubai’s financial district, they turned to the Italian Finasi which has a bouquet of prestigious brands in its portfolio. A top furniture provider was needed to give the interior as prestigious a touch as the exterior of the prominent mixed-use development that sits at the heart of Dubai International Financial Centre (DIFC) in the UAE. Hence, Finasi – which represents the most distinguished Italian furniture brands in the world, with an extensive portfolio that allows it to both propose solutions and provide its own luxury products – was commissioned for the job. The Italian interior, furnishing and full fit-out provider has supplied and installed luxury Italian furniture for the development which comprises freehold apartments, offices, retail units and a luxury hotel, completing the project last December. Fit-outs at Emirates Hills villas by Finasi. 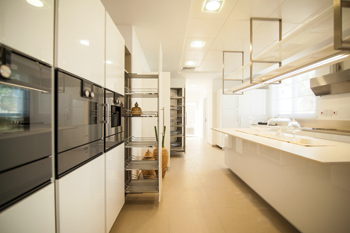 For the development, Finasi provided approximately 300 kitchen units by luxury Italian producer Dada. The scope of the project also included supply and installation of 679 wardrobes and 600 vanities by Molteni&C, merging contemporary Italian design with the avant-garde. In addition to the interior, Finasi’s scope stretched to the outdoor spaces, providing hints of Italian style throughout the exterior spaces as well. Outdoor furniture by Varaschin was chosen based on the client’s request and supplied for the pool area as well as a full furniture supply by Colombini Casa for the common areas. Since the opening of its Dubai showroom in 2009, Finasi has launched a turnkey division that offers a start-to-finish service encompassing every aspect of a project, from the interior design plan to procurement and then installation. In the interior design phase, Finasi proposes concepts and conceptual designs through 3Ds and structural drawings. 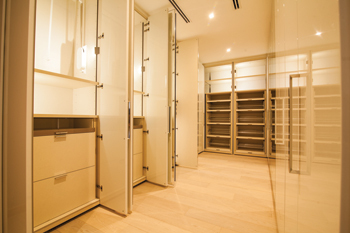 Backed by a team of architects, interior designers, shop drawers, 3D specialists, engineers, carpenters and experienced managers, its style-savvy service is more than just furniture supply; Finasi is a team of specialists that focus on detail and final result. What differentiates the company from others that offer similar services, is how it plans its work, says Sultan. “We take care of every aspect of the fit-out project in-house with our highly specialised team using only the highest quality material and services and, most importantly, our own products,” he says. With its tailored, customer-focused service, Finasi is emerging as the premier go-to company in the UAE for turnkey solutions. Combining celebrated Italian products with expert know-how and meticulous craftsmanship, the Burj Daman is just the first of high-end projects for Finasi. Exceptional quality ... Finasi’s focus. Finasi has established its position in the luxury design market by launching a full turnkey division for offices, residences and now, private villas. Finasi expanded to the UAE in 2007 and opened its showroom in Dubai two years later. Well recognised in the emirate for its partnership with top-notch furniture designers like Molteni&C, Armani/Casa, Dada and Varaschin, Finasi has undertaken prestigious contract jobs that have driven it into a new realm of business that is full fit-out services. In 2014, it started providing design-focused fit-out services to a number of private villas in Dubai and plans to continue full steam in this direction this year. Finasi’s latest villa fit-out projects are for private clients in the exclusive Emirate Hills and Palm Jumeirah. Here, as with any of their projects, Finasi has taken on the versatile role of architect, designer and interior decorator with an expert in-house team that is specialised in each individual area. For example, for a villa at Emirate Hills, it proposed appropriate designs based on the client’s needs, planning a layout of the property and suggesting concepts and conceptual designs through 3Ds and structural drawings. The interior design team proposed luxury furniture options based on the client’s style preferences. The wardrobes chosen are from the Gliss 5th Collection by Molteni&C, while the kitchen is a custom contract finish also by Molteni&C. Finasi has the top pick for luxury kitchens, living rooms, bedrooms and outdoor furniture in Dubai. Its partnership with prestigious Italian brands also allows quick and timely delivery – something Finasi has always prided itself on, says Sultan. The last step is installation by a skilled team of professionals. Quality is a top priority for Finasi, whose previous projects have included prestigious establishments in Dubai such as the Zeta Lounge in the Address Hotel, in addition to Burj Daman. “We are a design-led company with exceptional quality as our central focus,” says Sultan. “Whether the scope of the activity includes a private villa overlooking the sea or an office building in the heart of Dubai, Finasi promises the highest quality on-time delivery with a client-focused service. Founded in Italy in the 1970s, Finasi (www.finasi.ae) has established itself as a quality-led and trustworthy interior, furnishing and fit-out provider, with operations in Europe and the Middle East. The company has delivered interior projects to numerous blue-chip companies, hotels, retail boutique chains and private clients. It also works with government and semi-governmental entities in Europe and Middle East. Global experience combined with in-depth local knowledge allows Finasi to deliver world-class design solutions, and the company enjoys a reputation for quality workmanship and reliability in creating modern and efficient design solutions. Its wide range of services includes interior design and feasibility studies, interior fit-out construction, space planning, furniture, furnishings and equipment (FFE) selection, procurement and installation.